5.Manifesto of China’s Reformers: David Shambaugh’s China’s Future? Western executives are accustomed to long, deliberate planning cycles to research, develop, and launch products in their mature home markets. Many of them find it hard to manage the size, complexity, and speed with which business in China moves. Most multinationals have passed their “market entry” phase and have been forced out of their comfort zones to grow. Business conversations today focus on three topics: 1) scaling the business via geographic, customer segment, product line, or business model expansion (moving beyond established higher-end product positions in Tier I cities)1, 2) turning around a failing Chinese business, or 3) defending against aggressive Chinese competitors. The holy grail solution in the West is “innovation:” create a killer product that fits the market to create long-term sustainable advantage. Yet McKinsey’s 2015 China CEO survey revealed executives believe the key to success is credibility with headquarters and the local team, followed by people management (finding and retaining talent). 2 Innovation was ranked lowest. In this article, I argue that innovation (at least the simplified “new product” definition) is overrated in China. Given the pace of the market, innovation should not be viewed as an end-goal, but as a process that unlocks profitable business opportunities. Western executives should create an organization, operating mindset, and executional capabilities that enable them to quickly detect customer trends, create valuable solutions, and learn from local competitors. To achieve this aim, I propose companies embrace design thinking (“DT”) – a not-so-new methodology to bring innovative products to market. Channeling Deng Xiaoping and the spirit of China’s political and economic transformation, I propose Western firms employ “Design Thinking with Chinese Characteristics,” to make the approach more suitable and successful in the Middle Kingdom. Specifically, I recommend companies follow five principles in adapting their DT approach in China: 1) think like an anthropologist – and maintain that mindset; 2) embrace and (gasp) copy Chinese competitors; 3) view innovation more broadly, focusing on improving service to the customer; 4) do less market research, do more market; and 5) look beyond the China-U.S. or China-EU framework, deriving ideas from other markets that may be more appropriate to China’s context. To illustrate key points, I draw heavily from my focus in the dental/medical sector, which I believe is broadly applicable because of the diverse range of customer types and challenges present. 3 I also reference the collective experience of InterChina Consulting, a leading M&A and Strategy Advisory in China, where I serve as senior advisor. 4 In the conclusion, I present limitations to the DT approach and suggest areas for further inquiry, acknowledging that there is no “one-size-fits-all” solution in China. To win in China, Western firms need to run world-class operations. 5 Gone are the days when companies could offer second-generation products and rely solely on “guanxi” (relationships) to move business. In China, consumers are hard to pin down, competition can arise overnight, the playing field is not always level, and new technology and globalization accelerates the speed of change. 6 In response, companies are demanding more “compressed” consulting engagements, ones that seek rapid understanding of customer segments – an area where design thinking works extremely well. Design thinking has gained a widespread following the past two decades in the design community, with consumer product companies, and in the field of innovation. 7 DT involves five steps, putting the customer and rapid product iteration and development at the core: 1) empathize with your customer, often through observing them in situ; 2) define (or reframe) the problem/real issue(s); 3) ideate and brainstorm to generate solutions; 4) rapidly prototype concepts; and 5) quickly test those concepts, gain feedback, and iterate. The most common consulting request I receive is to evaluate potential distributors. Lured by a promise of “contacts” and “guanxi,” many executives forget basic business sense and make poor distribution choices. Without a serious understanding of the customer – who they are, how they buy, contexts in which they use or engage the company’s products – it’s impossible to determine whether a specific distributor makes sense. In fact, the majority of turnarounds InterChina has worked on are the result of poor distributor or partner selections. Many Chinese distributors don’t share a company’s brand vision, prefer to sell on relationship and price discount, and do not maintain sophisticated records. One European client had no visibility into end-purchases and price and was lucky to receive periodic Excel spread sheet updates. Clearer understanding of what is happening with customers – even if it means doing one’s own research or implanting one’s own employee in the distributor or with a key customer – has become more important than ever and benefits from thinking like an anthropologist. Anthropology distinguishes itself from other social sciences by its emphasis on the examination of context, the importance of participant-observation, experiential observation in research, and making cross-comparisons. Observation is critical because people don’t always do what they say they do. They may not be aware of their actions or may not be able to articulate their needs or desires, particularly in rapidly changing markets like China. To get a true picture of customers, companies need not only to talk to them, but also to observe them in situ, seeing through a customer’s eyes how they engage the product, category, or company. By doing so, companies gain a richer sense of their customers’ daily lives, specific language they use, and their moments of joy and pain. Industry reports are a good point of departure but lack the richness of observation. Traditional surveys rely on the fact that customers understand – and can clearly articulate – their own behaviors, attitudes, and needs. Interviewing and focus groups are slightly better, as adept facilitators can read or probe attendees, but they too rely on people accurately reporting what they actually do. Social media has become cost-effective and insightful, but online and offline behavior can vary widely. Firms like IDEO, Frog Design, and Continuum specialize in DT, but strategy consulting firms such as InterChina left our desks long ago, integrating field work into the approach to see the whole picture. As the Chinese say – 百闻不如一见 （bai wen4 bu ru yi jian – asking one hundred times falls short of seeing it once.) Companies with limited budgets can conduct “secret shopper” visits, ask to observe customers (such requests are often honored, and after 15 minutes they often forget they’re being observed), or visit customers with sales representatives. In any case, a best practice is to have company employees participate and learn observation techniques so they can later champion and spread the mindset internally, as many companies mistakenly view observation as a one-off conducted at the start of a process, rather than an ongoing process. One medical company performed observations (with permission) in public and private clinics. They wanted to understand doctor-patient dynamics and differences between the segments. In the public hospitals, industry reports and interviews claimed doctors favored prescribing “the top imported product,” but observations revealed doctors prescribed domestic knock-offs more than three-to-one over imports. Digging deeper, they discovered doctors were not conscious of their actual prescription habits, and found that doctors simply excluded imports from consideration because of perceptions (“This one I know won’t be able to afford it…” “This one will ask me lots of questions and I can’t interrupt my workflow…” “This one I might have to explain to the chair…”). These insights led to a better understanding that public doctors were busy and wanted minimal workflow interruptions, which in turn led the company to focus on correcting doctor and department misconceptions, as well as pre-educating patients. The Western executive who participated also left with a deeper respect for how the segment worked: “I was told public doctors have massive workloads and don’t have any chair-side rapport with patients, but until I saw it, I didn’t believe it.” He was also shocked to see the amount of data moving around by USB and local competitor reps assisting doctors, a direct response to restricted internet access in the hospital and the needs of doctors to get through patients quickly. The company, which relied on doctors downloading and displaying digital treatments, made it a top priority to figure how to adjust their offering to make it fit into a Chinese public doctor’s reality. Observations in private clinics revealed an opposite problem, one the executive had never experienced in Western markets: lack of patients. Through secret shopper feedback, the company learned private doctors lacked confidence and patients did not trust them. This led to a critical customer insight that drove action: “Private doctors need help building their reputation and patient trust.” Attitudes among patients varied heavily by city, complicating but clarifying their efforts. Patients in Beijing believed Beijing University (a public hospital) was the gold standard, so references to Beijing helped build credibility. In Shenzhen, a city of domestic immigrants with fewer State hospitals, patients were swayed by advertising and trends in Hong Kong. In response, the company launched “business education” classes for private clinics and created online forums that elevated the status of doctors in the eyes of consumers in a regionally relevant way. Importantly, none of these initiatives required reconfiguring the company’s product. Two years later, having established a base in 北上广 （bei shang guang — Beijing, Shanghai and Guangzhou), the same company considered geographic expansion. Knowing dynamics in Tier II and III cities were different, they maintained the anthropologist mindset. By listening to patients chatting on their cell phones in waiting areas, they discovered that the majority of patients in Shanghai were not from Shanghai, but hailed from affluent cities in the Zhejiang and Jiangsu area. This changed their expansion strategy dramatically. Investigation revealed that patients from Wenzhou came to Shanghai to see the top doctor in the region and to shop – something that would be difficult to replicate in Wenzhou. So instead of entering Wenzhou, they doubled-down to help existing Shanghai customers grow, and reallocated their search engine marketing spend to keywords and geographic pockets outside Shanghai to drive awareness of medical options in Shanghai. Similarly, they found competition among clinics intense, which worked in their favor to focus on Shanghai and open additional accounts there. For many Western executives, insights like these were counterintuitive. The logic in many Western countries would be “go to new geographies where additional demand lies,” but in East China they found they had much more room to grow without expanding. By thinking like an anthropologist and maintaining that mindset, the company dramatically outpaced its competitors. And by deeply studying Chinese competitors and looking for analogies beyond the U.S. and EU, they can tap into even more insights. The government’s approach the past 30 years has been to build “socialism with Chinese characteristics.” Western firms need to wake up and consider what “management with Chinese characteristics” looks like, and how it may help them succeed. Aside from having “home field advantage” – being more in tune with the culture, rules, and local business environment – Chinese companies exhibit several areas that Western managers can learn from. First, Chinese companies are keenly aware of the government’s role and the shifting regulatory environment, making them attuned to the importance of nonmarket strategies. A common belief among experienced expatriates is that anything is possible, but you need to understand where the government’s interests lie. Inside counsel for a large U.S. machinery maker learned tracking features on their equipment could run afoul of local regulators, so their government relations team took a humble approach and sought ways to shape unclear policy in more favorable ways. More importantly, Chinese firms – primarily the small, entrepreneurial ones – find ways to strip down products and get them to market quickly, often settling for razor-thin margins. One U.S. dental maker of sophisticated devices was shocked to find multiple competitors in China when they first entered the market. To put this in practice, companies should place more emphasis on competitive analysis and intelligence, making it a dedicated part of an employee’s role. One company extends competitive insight across the company by placing their own and their competitors’ social media sites on monitors near the tea station so employees can see how customers interact with the local and foreign brand. Additionally, a common practice among top Western firms is to regularly review competition in management meetings. One U.S. tech company’s Beijing office huddles 15 minutes daily to discuss what their main Chinese competitor (who owns 75 percent market share to their eight percent) is up to. The marketing head, who is Chinese, says the review sessions prepare them mentally for anything that might happen. Most competitive moves they ignore, but she reported they fold multiple ideas into their own offerings. “Chinese service” is no longer an oxymoron. Chinese firms are using technology, manpower, and talent to find creative new ways to capture and retain demanding – and less loyal – Chinese customers. A focus on service addresses a major problem multinational executives face: reconfiguring a physical product takes time, energy, and political will. Most foreign multinationals develop product centrally (outside China), using elaborate stage-gate methods. 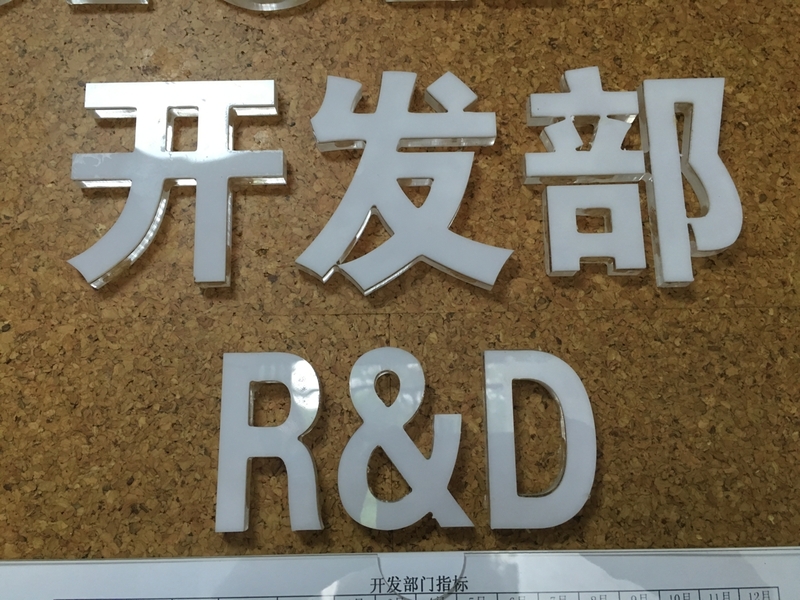 Getting central corporate resources and approval to develop a product specific to China, to say nothing of local regulatory approval or launch preparation, takes time. And unless the CEO or executive team is fully committed to China, a Chinese business that contributes less than five percent to worldwide corporate revenue rarely will get special consideration. Instead corporate favors focusing on product changes that will increase sales in their larger, existing developed markets (usually the U.S. and Europe). Sadly, by the time changes make it to market, the executive has already rotated into a new position. So for today’s executives – particularly those working for U.S. public companies where pressure to meet quarterly sales targets runs high – “quick wins” that come with service innovations or improvements are highly valued. Speed is everything in China. Repositioning a product, localizing packaging, reconfiguring price or bundling, rethinking sales/marketing/service, working with local partners, can all make a difference, and be done quickly. The most striking example of translating this principle into a winning go-to-market strategy is how one company up-ended its customer service model. The company, which provided customer service and treatment advice to doctors, started with a very Western approach to customer support: a toll-free phone number. By observing one segment of customers – clinicians in aesthetic plastic surgery centers who had low clinical skills but were strong at marketing and selling to patients – the company realized no one picked up a phone for help. The doctors, they discovered, wanted instant support but found it difficult to describe a patient’s condition over the phone, and they were too busy to download and email photos and fill out forms, the company’s service approach in the West. Around the same time, the company observed sales reps communicating to doctors with a new app called Wechat. In a semi-annual user insight roundtable, key customers bragged how the company’s Chinese competitor was using Wechat to update doctors on their order status in real time. Seeing the power of Wechat, the company set up a regional pilot that allowed doctors to use the mobile app to submit photos and leave voice messages with their questions. Doctors got rapid responses from the company’s support team in written form (doctors did not want their patients to overhear the advice), with links to similar treatment types they could show to patients. Doctors and sales reps loved the immediacy and intimacy. The team went on to win a regional innovation award, and the company began exploring ways to scale the service in China (Wechat has made a push in the B2B/customer service space) as well as take the service innovation to other emerging markets where Wechat is used widely. Because Chinese traditionally don’t expect a lot from China-made products, Chinese firms have had to work harder to differentiate, particularly through service. While Chinese firms don’t always nail service, they do try things. Western firms would be wise to do the same. The top comment I heard last year came from a European gourmet foods CEO, lamenting his company’s uneven success in China. He argued that all their deep research had not taken them very far over five years. Perhaps emboldened by the fact a Chinese company had purchased a stake in his firm, he argued: “Do less market research, do more market.” By that, he meant actively testing and trying ideas: essentially the core DT idea of rapidly testing, collecting feedback, and iterating. He sets a few “design guidelines:” ideas cannot violate corporate ethical standards, marketing initiatives should integrate the sales force, and data to measure success must be generated. He gives his team some open rein, and then largely steps out of the way. None of the western executives admit it, but they actively pursue local initiatives that fall “under the corporate radar,” embodying the Chinese saying that the mountains are high and the emperor is far away (山高皇帝远 –shan gao huangdi yuan). The key to success with this strategy is having a good relationship with one’s regional or corporate boss, and the ability to dramatically execute if the idea is a winner. Fast execution is critical because the window of time on successful ideas is brutally short in China. An example of this practice at work came from a provider of aesthetic medical solutions. They realized doctors wanted to grow their businesses and consumers were skeptical of private doctor clinical skills (the trust issue alluded to earlier). In response, they created an online forum where doctors, backed by the brand, could provide live “expert” Q&A to consumers nationwide. The forum became a win-win-win for the company, doctors, and consumers, with doctors lining up to use the service. Most of the companies and executives I work with are of U.S. or Western European origin. The vast majority, however, are global citizens – they speak multiple languages and have taken on postings around the world. The most interesting sea change is that most look beyond the U.S. and EU for inspiration. Like anthropologists, they realize China is at a different stage of development and has a different historical and political-economic underpinning, one that doesn’t fit the Western model. One dental company found China more similar to Spain than any other Western country: customers that operated on lower margins, regional differences and languages, heavier reliance on relationships, considerable grey market activity, and a burgeoning segment of university students seeking treatment that did not show up in the U.S. or Northern Europe. The two general managers opened a direct line and benefited immensely from the conversations, taking strategic advice from one another. Indeed, top managers actively develop the ability to look at analogous areas and build relationships with those who can bring them insight. There is still plenty to learn from the West, and no country or company has a monopoly on ideas. Silicon Valley’s tech environment closely resembles the complex, rapid change in China, and approaches there can work in China. But the tide is shifting, and the hubris and slow corporate decision-making in the West is running its course. In this article, I’ve put forward the notion of “Design Thinking with Chinese Characteristics” and provided examples for how this approach can help Western firms succeed in the complex, rapidly changing mainland marketplace. No approach fits all. Sectors that are heavily regulated by the Chinese government (banking, energy, telecom, insurance) still exist, where foreign players are more restricted to the fringes. Even in these sectors, a thorough understanding of customers and intermediaries is fundamental to playing the game, and in fact may point to heavy and creative use of nonmarket strategies. Even seasoned “China hands” (expats who speak Mandarin or who worked in China earlier in their careers) need to find ways to let go of outdated models they have about China. More research is needed on Chinese management techniques, how Chinese innovation expresses itself, and differences between sectors. Anyone who touches Chinese consumers knows how rapidly they are changing. Technology, globalization and the rise of China and its homegrown companies will shape the new business landscape of the future. Executives and companies with experience in the China market gain valuable skills and experience necessary to survive in the new global economy. May a design thinking approach with Chinese characteristics better prepare us all. 1) Think like an anthropologist and maintain that mindset – Being close to customers and observing them is critical to picking up market insights – not only at the initial discovery stage, but on an ongoing basis, too. 2) Embrace and (gasp) copy Chinese competitors – Rather than competing head-on or ignoring entirely local competition, following, analyzing, and copying savvy Chinese companies can be a shortcut to gaining local knowledge. 3) Think about innovation more broadly, focusing on service to the customer – Taking advantage of local insights and conditions to deliver service innovations makes a big impact quickly. 4) “Do less market research, Do more market” – Staying in close touch with customers, testing and co-creating concepts as they head to market is the best way to succeed in a rapidly changing market like China. 5) Look beyond the China-U.S. or China-EU framework – deriving ideas from, and feeding ideas to, other emerging markets are often more appropriate and beneficial than looking back to the U.S. and Western Europe. Michael C. Wenderoth is an Executive Coach, professor at IE Business School in Madrid and Senior Advisor with InterChina Consulting. From 1994-97 he served as Project Manager of the Beijing United Family Hospital. Wenderoth teaches and writes on China, Leadership and Sales.